For the potato salad, boil the potatoes in salted water just until tender; drain and cool slightly. Slice potatoes in ¼-inch-thick rounds. Pat the halibut dry with a paper towel. Heat a heavy nonstick skillet over medium-high heat. Brush both sides of halibut with olive oil. Place in the preheated skillet and cook, uncovered, for about 3 to 4 minutes, until browned. Shake pan occasionally to keep from sticking. Turn halibut over; season with the dried dill and a few turns of fresh black pepper. Cover the pan tightly and reduce heat to medium. Cook an additional 6 to 8 minutes for frozen halibut, or 3 to 4 minutes for fresh fish. Cook just until fish is opaque throughout. Break into large chunks (removing skin, if any). Mix the celery, orange segments, red pepper, parsley, fresh dill, and seasoning salt together in a large bowl. Add the potatoes and gently stir. For the dressing, add the olive oil to a small pan, and heat over low heat. Sauté the green onions for a minute or two. Whisk in the orange juice and Dijon. While warm, pour the dressing over the salad. Add the halibut chunks to the salad and mix gently to combine. 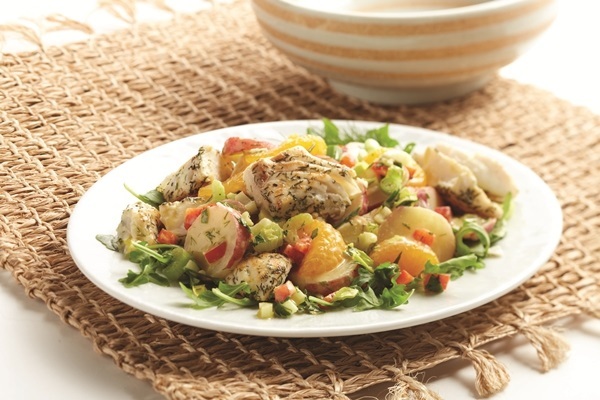 To serve, portion a handful of arugula onto plates; top with halibut potato salad. Cook’s Tip: If using canned mandarins, omit orange juice and use the juice in the can.